This sign is interesting for sure and contains so much detail. The sign measures 26″ x 16″. 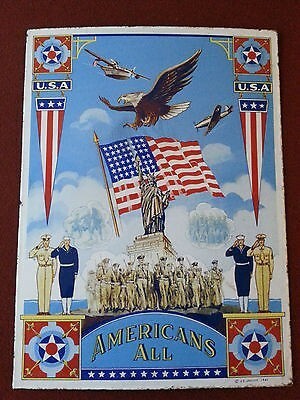 The text on the sign reads “Americans All.” The sign is surrounded by a medium sized white boarder. In each of the four corners, there is a red square. The top two squares are smaller than the squares at the bottom. Inside each red square is a light blue circle, with a smaller blue circle and star within it. The top two red squares have signs hanging from them that read “U.S.A.” and then a pennant hanging from the signs. The bottom two red squares have a small platform on top of them. Each platform has two soldiers saluting. In between the bottom red squares is a flattened tombstone shape in blue with the text that reads “American Alls.” Below the text are 13 white stars. Above the text is a group of soldiers all standing at attention. Behind and above the soldiers is both the Statue of Liberty, a flag, a bald eagle, and two planes.